First there was Bennifer, then Robsten, Brangelina, and Kimye, but are you ready for WandaVision? 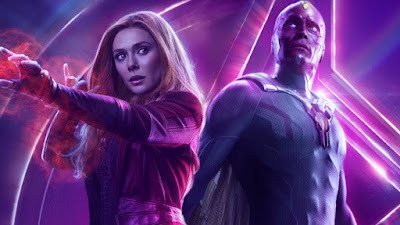 Marvel's upcoming Scarlet Witch and Vision series coming to Disney+ has been given that weird new title for some reason, which should make it fun for Elizabeth Olsen and Paul Bettany to talk about. The news comes from Disney's recent investor presentation, where they unveiled a number of details about their Disney+ streaming service and the many programs it will offer. WandaVision recently added Captain Marvel screenwriter Jac Schaeffer as its showrunner, and will center on the romantically-involved Avengers duo. Neither of them came out of Avengers: Infinity War looking too hot, so we'll have to see how Marvel gets around that. Other Marvel shows on the way include a Loki series starring Tom Hiddleston, Falcon & Winter Soldier featuring Anthony Mackie and Sebastian Stan, and a Hawkeye series announced just days ago. It's not lost on me that all of these shows feature characters with younger versions who became part of the Young Avengers team. Nobody has said anything about that yet, but part of me thinks something is afoot here. WandaVision could introduce their children, Speed and Wiccan; the African-American hero Patriot could be part of Falcon & Winter Soldier; Loki could actually center on his reincarnation as Kid Loki; and we already know Hawkeye will see him passing his bow to Kate Bishop. I smell a Young Avengers series in the works, even if nobody at Marvel is saying so right now.